Spectacularly iridescent! 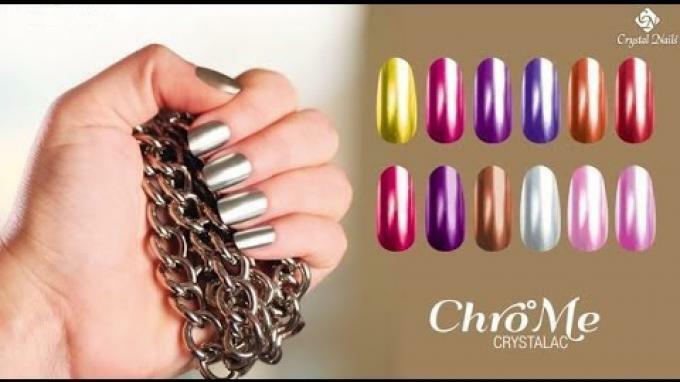 Join in on the latest nail art craze and get the breathtaking mirror effect with the ChroMirror Holo #1 chrome pigment powder! 1. Remove the shine of the nail plate with the Soft Touch Buffer then prepare it with Lint-Free Towel soaked in No Buffer Scrub. 2. Apply two layers of ONE Step CrystaLac 1S35. Cure the first layer for about a minute under UV lamp. Cure the second layer for approx. 1-2 minutes then apply #0 One Step Crystalac. 3. After approx. 30 seconds of curing apply ChroMirror Holo #1 chrome pigment powder with the Shading applicator. 4. Dust off the nail with a soft brush. For better adherence apply Primer Acid Free. Then apply another layer of #0 One Step Crystalac and cure it for approx. 30 seconds under UV lamp. 5. Appy ChroMirror Holo #1 chrome pigment powder as before then apply Primer Acid Free. Finally apply #0 One Step Crystalac and wait until the cure time expires.